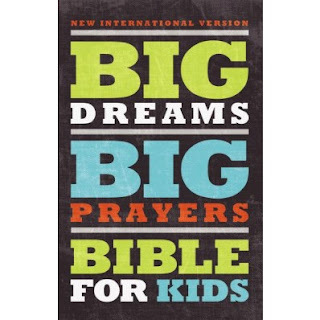 The Big Dreams, Big Prayers Bible forKids, NIV includes the complete New International Version (NIV) of the Bible along with devotions, prayers, and highlighted verses to help kids pray and listen for God’s answers to their prayers. Sometimes prayer is a difficult concept to understand. The Big Dreams, Big Prayers Bible begins with an excellent explanation of what prayer is and how to talk to God. Throughout the scripture you'll find devotions written just for kids. They speak about prayer and give great examples and explanations children can understand. In the back you'll find a list of the devotions and the page number they're on. There are also three reading plans to engage the reader in doable segments. I really like the journal pages in the back where the reader can write down prayer requests and keep track of the answers. Each Bible book has a brief information page. This is a great Bible for students age 10+. Five stars.